Utility rates are below the national average in most cases and providers offer superior service, quick restoration and ease of payment. As Orange County grows, our utility providers grow, too. Orange County's water and sewer capacity greatly exceeds customer demand, creating opportunities for ample growth. The Town of Orange and Rapidan Service Authority (RSA) provides water and sewer service to residential, commercial and industrial customers in the county. The Rapidan Service Authority (RSA) includes five systems: the Route 15 and Route 20 water systems, the Gordonsville sewer system, and the Lake of the Woods/Wilderness water and sewer systems. 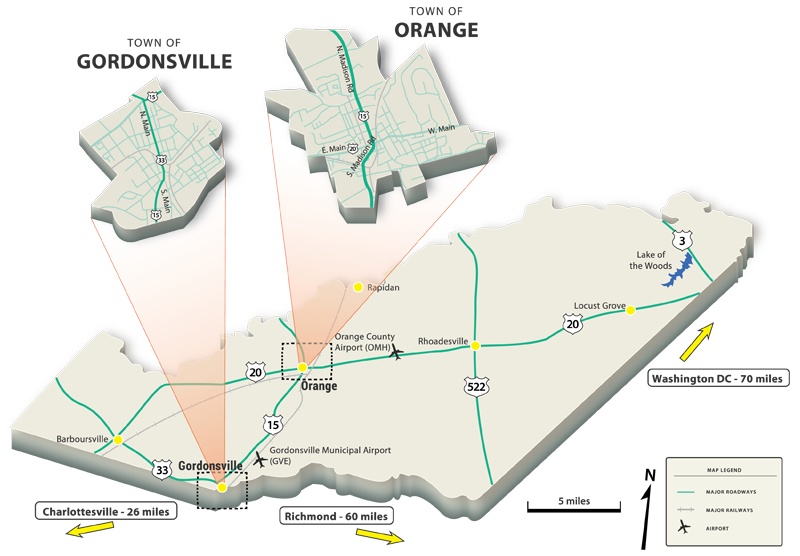 The Route 15 water system supplies water, purchased from the Town of Orange, to customers along Route 15, including the Thomas E. Lee Industrial Park and to the Town of Gordonsville, which then distributes the water to its residents. The Route 20 water system is the smallest system with about 150 customers and provides water from a well to customers near the Orange County Airport. The two largest systems are the water and sewer systems that service about 4,300 customers in the eastern end of the county. Water drawn from the Rapidan River is treated and distributed to communities and businesses along Route 3. Sewer service is also provided in this area and the sewer treatment plant returns water to the Rapidan River. *Lake of the Woods pay an additional $7.00 per month for vacuum sewer system. *The Town Waste Water Treatment Plant (WWTP) currently operates under a seasonally varying permit limit. The county is served by WJMA located in Orange County and broadcast stations from Culpeper, Fredericksburg, Charlottesville, and Richmond. The county is served by satellite, cable, and broadcast TV from Charlottesville and Richmond.